Catching beaver traps requires careful preparation. It is necessary to know the particular behavior and habits of these animals. Also, before the start of the season, it is worthwhile to notice in advance the most promising habitats for them. How to set traps on beaver? An important role here is played by the trap model and the place of its installation. The main features of the habitat of animals. 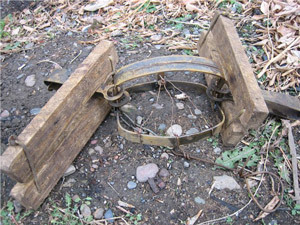 Consider the most commonly used places to install traps on beaver . They are laid to feed areas. In the fall, beavers begin to fall off their food by winter. Determining the place of feeding, you can put a trap on the path leading to it. The probability of hitting a rodent in it is extremely high . It makes sense to hunt beaver with traps in autumn or winter on the feeding trails. Beavers make them in the autumn, when it is time to store food for the winter. In channels, it makes sense to use only feed-through traps . These are constructions from soil and branches. Beavers tag them and use them for orientation. That is why the signal hillocks are especially effective at working with beaver jet baits . Almost all beaver hunters prefer traps of frame type No. 5 and No. 7 . It is also desirable that the trap had a chain with a ring , thanks to which it is possible not to worry that the beast, once in the trap, will drag it along. Carefully inspect the traps with the purchase just necessary. 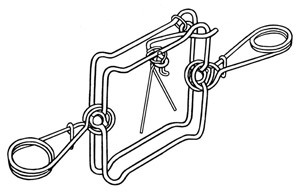 The overall quality of the trap (painting, accuracy of manufacture). Mining beaver trapped – dangerous occupation! These devices can cause very serious injuries toinexperienced hunters. Beginners it makes sense to go hunting in the company of more experienced comrades. It is worth remembering about one important feature: do not put more than two traps in one beaver settlement . Four-legged lumberjacks have excellent hearing and great caution, so the rest of your traps will be useless. And because you do not want to kill the entire livestock. Therefore, after successfully catching a beaver with traps, wait a week or two and only then repeat the hunt . Hope this article helps you. Be careful and do not rush, do everything gradually and efficiently. And do not forget that hunting has long been not a necessary means of subsistence, but rather social fun. Do not crave for profit and have fun. Beavers are an important object of fur trade . Also they are used in food and chemical (perfumery) industries. 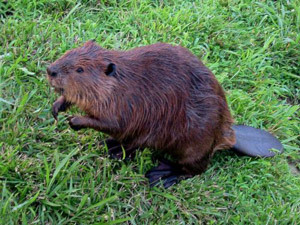 It is necessary to hunt beaver competently so that the beaver families stay in one place for a long time. It is much more convenient to have certain points for fishing, and not to look for new ones before each hunt.